“Our story started at seven days old with long nights and days,” said Patsy Garza. Those seven first days of life belong to her niece, Jazzalyn, who was born with a disorder called Severe Combined Immunodeficiency (SCID). 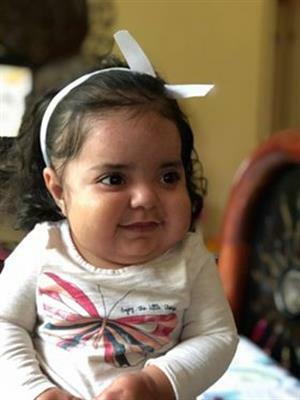 Seven remains an important number in the Garza family, as Jazzalyn now requires only seven medications—a remarkable decrease from her original protocol. Jazzlyn’s journey, though full of treacherous ups and downs in the first few chapters, has just begun, and the future looks bright. Now two years old, Jazzalyn’s vibrant personality pushes through the rocky soil of recovery and blossoms, bringing great joy to those around her. Jazzalyn loves to play with her cash register—scanning groceries and placing them in her shopping cart—just like His Grace Foundation volunteers scanned groceries and necessities for Jazzalyn and her family during their time on the Bone Marrow Transplant Unit. Jazzalyn mimics singing, dances with her whole heart, and pretends to be a mommy to her baby doll. Much like a mommy, she diligently packs a bag before going out, ensuring that Eli—her pacifier attached to a plush elephant—and her “teta” (bottle) have found their place. When it’s time to relax, Jazzalyn navigates an iPad to find YouTube Kids. Jazzalyn has made it a considerable distance, but the road to recovery still stretches out in front of her. Jazzalyn travels from her hometown in Laredo to see her doctors in Houston once a month. A therapist comes to her house to help her with delayed speech. Jazzalyn doesn’t walk alone just yet. But she continues to press on—determined to reach the next goal set before her.